CLEMSON, SC – Former Clemson Athletic Trainer Fred Hoover was presented with the Order of the Palmetto Thursday evening in Columbia, SC. It was presented at a banquet in conjunction with the South Carolina Athletic Trainer’s Association annual convention. The Order of the Palmetto is the highest civilian honor awarded by the Governor of South Carolina. It is awarded to persons who make contributions of statewide significance. Hoover served as Clemson’s Head Athletic Trainer for 40 years (1959-99). The man who worked under seven Clemson head football coaches, including the legendary Frank Howard, never missed working a Clemson football game from September 19, 1959 (North Carolina game) through the season finale of 1998 against South Carolina, a streak of 445 in a row. He still works all Clemson home games as a liaison with the game day officials. In his 40 years, Hoover worked with 39 Clemson All-Americans, 17 first-round draft picks, 17 future NFL All-Pro players, and 120 future NFL players. He worked 16 bowl games, worked on the staff of 11 ACC Championship teams and 13 Top 25 seasons during his tenure. He coordinated the training room needs for 17 Clemson players that went on to win Super Championships in the NFL, and worked with 950 different Clemson lettermen. The native of Jacksonville, FL graduated from Florida State in 1953. He served as trainer at his alma mater for two stints, 1952-53 and 1957-58, before coming to Clemson in 1959. Professionally, Hoover held just about every administrative post with the National Athletic Trainers Association, including Chairman of the Board. In 1981 he was enshrined in the Citizens Savings-Helms Athletic Foundation Hall of Fame for his work in his chosen field. In 1982, Hoover was inducted into the Clemson Athletic Hall of Fame. In 1983, Hoover was the recipient of the Distinguished Service to Sports Medicine Award given by the American Orthopedic Society for Sports Medicine. In 1987, he was awarded the South Carolina Hall of Fame Distinguished Service to Sports Award. 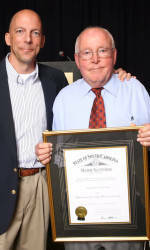 In 1994, the South Carolina Trainers Association created the Fred Hoover Award for excellence in Athletic Training. The winner of that honor this year was current Clemson Head Athletic Trainer Danny Poole, who worked under Hoover for many years before taking over his duties when Hoover retired in 1999.